In 1984, when the Department of Energy announced that Ashe County, NC, was being considered as the site of a high-level nuclear waste dump, Janet Marsh organized her friends and neighbors, holding the first meetings at the Holy Trinity Church of what would become the Blue Ridge Environmental Defense League. At the time, she was raising young children and farming in Glendale Springs, and shared concerns about the Federal Government's plans with other parents, farmers, teachers and merchants in the area. A study group was formed, and the example that has served as the model for BREDL and its chapters was born. Janet served as BREDL's Executive Director for over two decades, 1986 until 2012. From July 2012 until her death, Janet acted as strategic advisor to the BREDL Board Executive Committee. In her early adult life, Janet was a successful teacher and a rising star in the educational establishment of North Carolina. Blinded by a congenital disorder in her twenties, Janet's career was cut short. 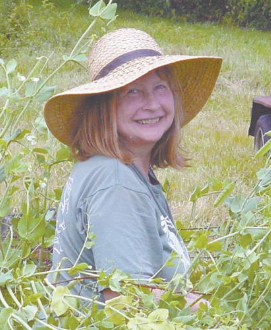 Nevertheless, she founded the Blue Ridge Environmental Defense League to fight a national nuclear waste dump near her home in the Blue Ridge Mountains. The community group was successful in stopping the dump, and the fight brought together the founding members of BREDL. The principal organizers, recognizing an ongoing need, stayed together to form a 501(c)3 nonprofit. The community organizing strategies, vision, and tactics which helped win BREDL's first victory guide us today. Today BREDL is a league of more than fifty community-based chapters serving the Southeast with the founding principles of earth stewardship, public health protection, environmental democracy and social justice. A woman who shouldered much responsibility without fanfare, Janet poured herself into the organization she founded. Under Janet's leadership, BREDL received numerous awards and accolades including the Sierra Club Legal Defense Fund National Award for Environmental Activism in 1989, CHEJ National Award for Outstanding Work in 1993, the NC Governor's Conservation Achievement Award for air quality protection in 1999, and the Bob Sheldon award in 2014, in honor of BREDL's thirtieth anniversary. In December 1988, the Winston-Salem Journal featured Janet in the paper's Tarheel Sketch series. In the article, she stated "We think in the short term. We think of the quarterly ledger sheets or of the next sales profit - but not of the consequences of our actions." Janet was also featured in an article in The Independent from the December 19, 1986-January 15, 1987 edition. That article was titled "She has the vision to see we can live without fear". Sandy Adair, the BREDL administrator at the time, had this to say about Janet: "Her mind is like a steel trap, as far as reading official documents and reading between the lines. She sees shortcomings and she sees places where they've tried to gloss over an issue. She can see the empty loopholes." Most recently, an interview with Janet appeared in the May 2014 issue of All About Women, a lifestyle magazine that recognizes women in leadership in the high country of western North Carolina. The BREDL family and communities throughout the Southeast have lost a true friend and advocate. Condolences may be sent to Louis Zeller, PO Box 88, Glendale Springs NC 28629.